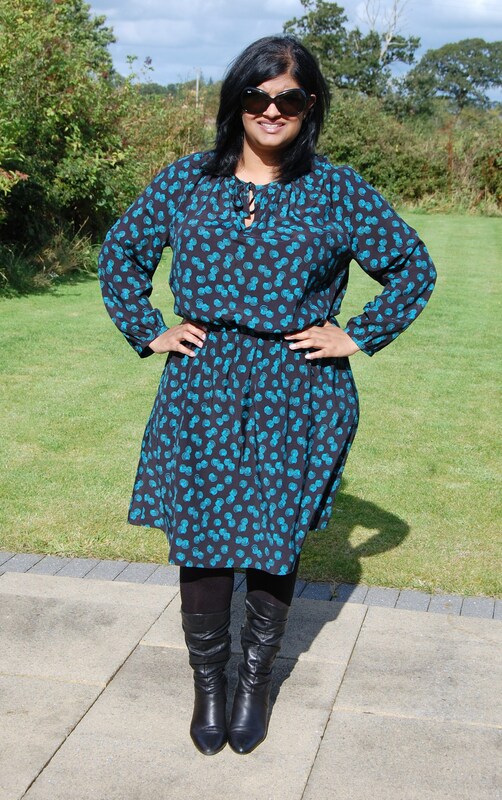 I said I wanted to make another easy to wear transitional dress, and this is it. It’s the Eliana dress by Pauline Alice. Some of you may remember I was a pattern tester for Pauline last year, for her Quart Coat pattern, and Pauline kindly sent me a copy of this pattern along with a final pattern for the Quart Coat once the pattern was finalised. 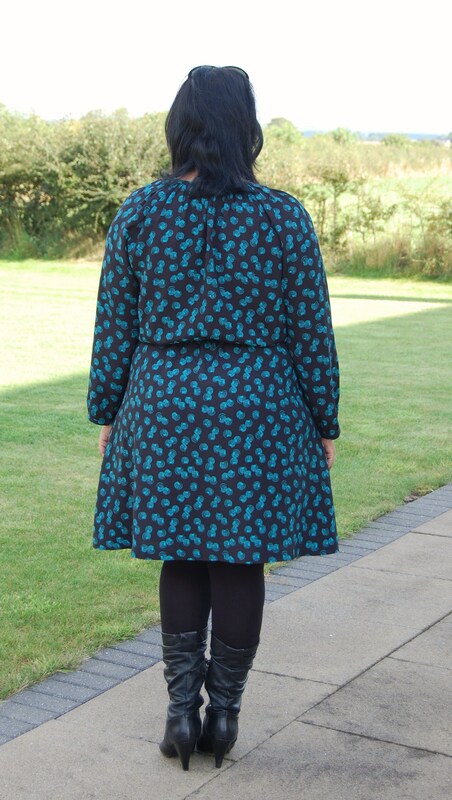 It struck me that I don’t need another copy of the Quart Coat, and as we are approaching coat sewing season, I thought I would offer one of my readers a chance to win the pattern. Just leave me a comment below before midnight GMT 27th September (that’s next Sunday) and I will randomly pick a winner. Open internationally. The weather wasn’t the best when we took these pictures but they will have to do. I love the finished dress. 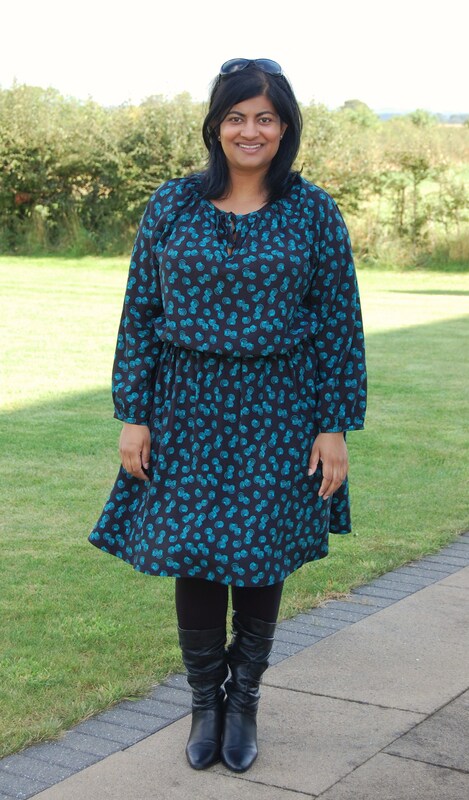 This is another easy to pull on, wash and wear dress, made from a lovely printed viscose that I purchased locally. I love the fact there are no fastenings for this dress. There is a slit at the front (or you could have it at the back), with a tie formed from the bias binding which finishes the raw edge of the neckline. I also love the elasticated waist (I know not everyone does), but it just gives the shaping required and makes this super comfy to wear. I also think the slightly 70s feel of the pattern is very on trend right now. For the most part yes. There is one part that I didn’t find very clear (sorry Pauline :-)) which was what seam allowance to use for the bias binding. I ended up emailing Pauline and she clarified to use 5/8ths of an inch. The pattern is rated as easy, and it was, but you have to be confident at making/ applying bias binding to finish the neckline slit, the neckline itself and the wrist openings. Also, I would say don’t attach the skirt to the bodice until you have finished applying all the binding as it may make things a bit unwieldy. I love the easy to wear style, but you could easily make this up in a fancy silk, and it’s very on trend at the moment. A silk maxi version would be lovely for a special occassion. Nothing to dislike. I added 3.5 inches to the length, but took 1 and 3/8ths inch for the hem. I shortened the sleeves by 4 inches. I made my own bias binding from self fabric. When I made the proportions of the neckline as suggested in the pattern instructions it felt a bit…constrictive, so I made the neckline longer. It fits fine at the back, but the shoulder darts are slipping backwards. On my next version I will shorten the front portion only I think. A great on trend and easy to wear dress. Thanks Pauline for the pattern. Have a great week and don’t forget the giveaway! The dress looks gorgeous :-). I am in love your dress, It is a dress I would make for the fall season, instant gratification. You have inspired me to want to make the Quart coat for this winter when you made it last year. Love the dress, and I have wanted to get the coat pattern so thanks for the giveaway. Very nice dress. But it’s the coat I’m after 🙂 so please put my name in the hat! Your dress looks lovely on you. Would love to win the coat. Many thanks for giving everyone the opportunity. I love the Quart Coat pattern. Please enter me in your drawing! I am going to try to make a coat this fall. Looking at the waterfall coat or maybe a cape. 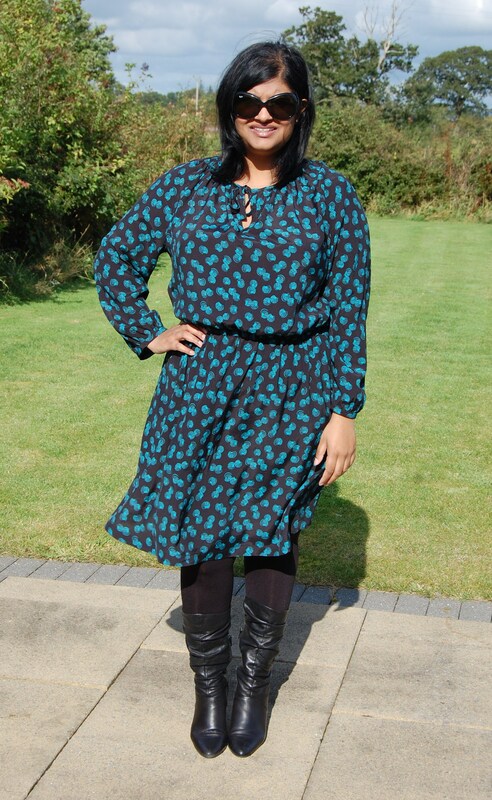 This dress really suits you, a lovely style for the autumn. I love the coat too, and I have the material waiting! The dress looks lovely on you and the proportions are just right! Quart coat is in my wish list, thank you for the giveaway! What a lovely dress! I’d love to win the coat pattern, I’ve had my eye on it for a while!! I need like 10 of these dresses now! I love the print and the ease of wear. It looks great on you. It reminds be so much of a Burda magazine pattern I’ve been eyeing from last year that I have on my short list of things to sew soon. Very pretty dress. I love your style! Lovely dress! Traced the pattern recently but then never made it up – you’ve just inspired me to make it up asap! Your gray Quart Coat with the red lining is gorgeous! I’ve had my eye on this pattern, but looking at your version made me believe that it could work for my figure. I’d love to win the pattern! 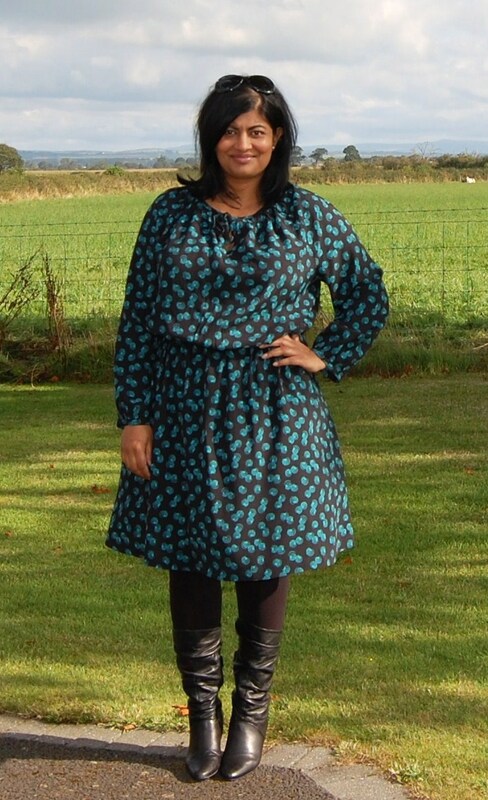 Love your dress….and would love to have the coat pattern! I remember when you showed your quart coat. It’s a beautiful coat and is definitely on my list of things I would like to sew. Looks like there’s a hint of autumn in the air. Your lovely dress is styled perfectly for the season. I would love the Pauline Alice Quart Coat pattern. Thanks for hosting a giveaway. Never made a coat so would be fab to add to my to-do list! This dress suits you very well Manju. The colours are lovely too. I really love this dress too! It’s a perfect silhouette with a combination of beautiful colors and print. Very nice job! i loved the carme top. It’s a very flattering shape. I love the viscose too, as it drapes beautifully. I like the colour and shape of your dress. The fabric drapes beautifully. Your dress is gorgeous! I love the colours in the fabric, and it looks great with your boots. Thanks for the chance of winning your giveaway! Your dress is lovely. It looks very chic and comfortable. Include me in the giveaway! It would be fun to make up the Quart Coat. Lovely fabric choice for that dress. Your outfit is perfect for the fall! I have been following your site for a while and you always inspire me to get sewing. A gorgeous dress, great colour with a good fit and drape – it ticks all the boxes!